Ohhhh, I dunno… it’s all a bit macho innit… cheesy 90s machismo. I’m not a snob (well, alright… I am) but it’s a bit mainstream isn’t it? I hate this just as much as I’d hate a stiletto shaped bottle of scent (there must be one out there?). I know, I know… look past the packaging… but I’m struggling. Having said that, I think the packaging will probably tempt just as many men as it puts off… I can see this on the Christmas wish list of many 16yr olds. Well… it’s not my favourite and it does border slightly on the generic fresh scent for “manly” men… but… it just about dodges the bullet. Davidoff Champion has a nice citrusy kick that although never really fades enough to reveal anything beyond this, is almost pleasant enough on it’s own. Staying power is pretty good too… I just wish it were a bit more complex. This ain’t gonna beat Marc Jacobs Bang as men’s scent of the season, that’s for certain! 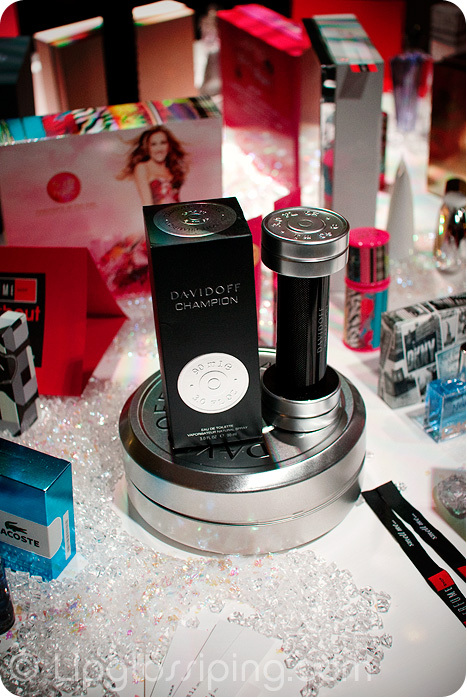 Davidoff Champion is available in 50ml & 90ml EDT and priced at £35.50/£43.50 respectively. Did you like the Marc Jacobs’ Bang? There was a sample in Vogue that I tried but it was horrid and I was disappointed. I really love it… my husband wears it now. Do you not like the strong pepper perhaps?